Talking on an aviation radio and understanding air traffic control instructions can be one of the most intimidating aspects of flight training. 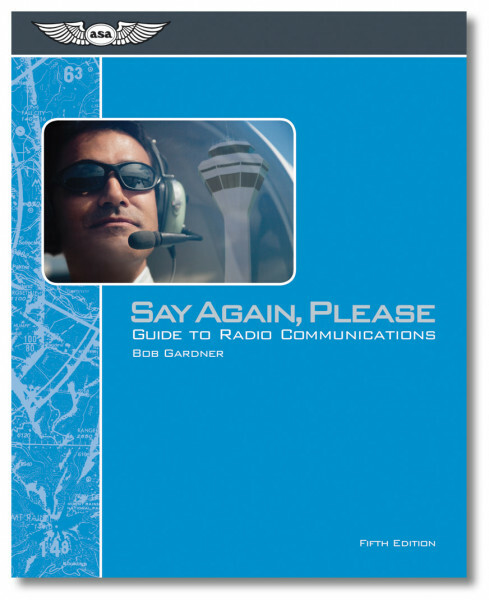 Bob Gardner's Say Again, Please teaches readers what to say, what to expect to hear, and how to interpret and react to clearances and instructions, while detailing the airspace system and explaining how the ATC system works. This new Fourth Edition has been expanded and updated throughout to reflect current rules and operating procedures. Chapters cover communication etiquette and rules, understanding radio equipment, emergency situations, and both VFR and IFR communications and clearances. Also included: a concise summary of the FAA’s communication facilities and their functions, airspace classifications and definitions, and the FAA’s recommended shorthand for copying clearances. The communication requirements for entering, departing, and transiting each class of airspace is explained in detail by following along with the author on "simulated" flights. A full-color sectional excerpt is provided for the example flights, so readers can review the map while reading the explanation for flying and talking in each area. Readers will learn everything they need to communicate effectively in VFR, IFR, and emergency conditions. Softcover, glossary and index, illustrated throughout, 216 pages, including a bound-in full color example map. Listen to Bob's Say Again Please Podcast in this "Finer Points" Podcast. To listen to the podcast online, left-click on the link above. Your browser will open the link in a new window. To save the file for offline listening, right-click on the link and select 'Save Target As..' (Internet Explorer), select 'Save Link As..' (Firefox). NOTE: If you have an application installed on your computer for playing MP3's offline, this application may open and play the file instead of your browser if you choose to listen online. For off-line listening, you need a player that supports the 'MP3' format. Bob Gardner's conversational-yet-concise writing style in his approach to aviation communications will help increase your comfort level when using an aircraft radio. Say Again, Please features "talk" examples of typical radio transmissions that explain how the air traffic control system works, as well as present simulated flights that clearly demonstrate correct communication procedures in each class of airspace.